Dave Kearney's two-try debut haul put the gloss on a trademark Joe Schmidt victory, the perfect way for the new coach to launch Ireland's autumn international series. Leinster wing Kearney climbed off the bench to join brother Rob in the second-half fray, and he promptly bagged two tries in 13 minutes as Ireland beat Samoa 40-9. Peter O'Mahony claimed his first Ireland try too, with replacement Sean O'Brien and wing Fergus McFadden also crossing at Dublin's Aviva Stadium. Scrum power formed the bedrock of this result, with 24-year-old debutant prop Jack McGrath turning in a top-class performance. Meticulous former New Zealand schoolteacher Schmidt was famed for his attention to detail in his Leinster coaching tenure and Ireland made it abundantly clear the new head coach has transferred that thirst for detail to the international arena. Munster flanker O'Mahony's try was the product of an inch-perfect rolling maul, the highlight of the night in terms of team play.Along with detail, Schmidt loves high intensity and accuracy. Despite the victory clamour, the new boss will definitely be keen for greater sharpness in his other two chief elements for the next fortnight, when Ireland face Australia and New Zealand. Ireland created precious few opportunities behind the scrum in the first period, but their tight-exchange superiority was enough for a 14-9 lead at the break. Samoa's Siva Tau war dance charged the Aviva Stadium atmosphere, specially led by Brian Lima in memory of late and legendary prop Peter Fatialofa. Ulster fly-half Paddy Jackson opened the scoring with a penalty after McGrath's good scrum work and a turnover from stand-in skipper Jamie Heaslip. Tusi Pisi quickly levelled the scores from the tee though, with Ireland ruled offside in defence. Leicester Tigers prop Logovi'i Mulipola hobbled off moments later, dealing another blow to the visitors, already without scrum cornerstone Census Johnston. George Pisi and Alapati Leiua underscored Samoa's attacking intent with neat breaks, but neither side could force a first-quarter try breakthrough. Jackson doubled his and Ireland's tally from the tee to open the second quarter, after further scrum pressure from the hosts. A textbook catch-and-drive lineout followed another scrum penalty, producing an impressive try for O'Mahony. Ireland drove Samoa from the middle of the 22 over the whitewash, with new coach Schmidt's attention to detail paying immediate dividend. Samoa rallied and Tusi Pisi duly notched his second penalty - but struck a post with his third shot at goal. Fergus McFadden wriggled close after Rob Kearney's break, before Brian O'Driscoll failed to sneak home. Italian Television Match Official Carlo Damasco then judged George Pisi to have tip-tackled Tommy Bowe, with the Northampton centre handed a yellow card. Jackson slotted his third penalty to close the half. O'Mahony's searing break brought the second period to life, lock Mike McCarthy shoving the Munster man through a midfield hole. The 24-year-old flanker's stray pass ruined the move, but Ireland quickly struck their second try through O'Brien. Samoa wing Brando Vaaulu horribly misjudged Jackson's bouncing punt, O'Driscoll nipped in to steal and flash a pass out wide to McFadden in the visitors' 22. O'Brien had only been on the field six minutes when he powered home, registering his third try for his country. Tusi Pisi and Vaaulu's nasty clash of heads ended both men's night prematurely, with Pisi receiving lengthy on-field treatment before being carried off via stretcher. Versatile Fotuali'i stepped out to fly-half in the wake of Tusi Pisi's nasty head injyury. And the 31-year-old captain landed Samoa's third penalty of the night as the final quarter took shape. Ireland hit back straight away though, with a debut try for replacement Dave Kearney, who provided a neat finish in the right corner. The 24-year-old Leinster back-three even had chance to celebrate the moment with older brother and club-mate Rob. 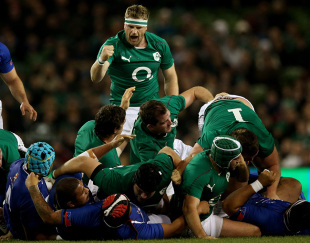 Schmidt's men sustained the pace, with McFadden claiming the fourth try, and his eighth in Ireland colours. At the death Dave Kearney was able to cross again, taking a scoring pass from replacement Eoin Reddan. 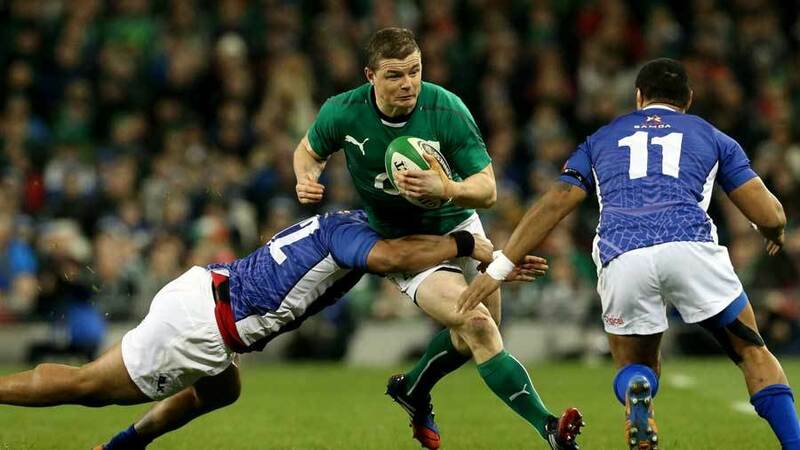 And Ireland were able to shut out the visitors, who failed to score a try for the first time in 26 Tests. A fine start to the Schmidt era, but the ex-schoolmaster will know Ireland must offer more in the next two weeks to sustain this winning opening.